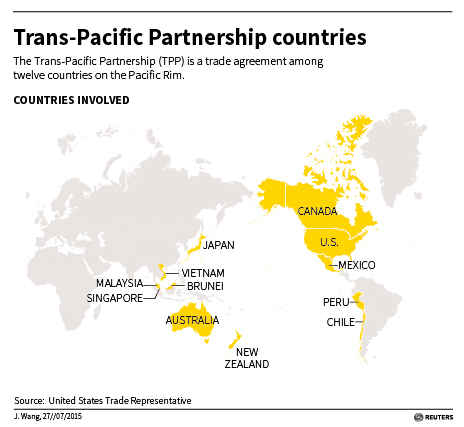 Does the Trans-Pacific Partnership Increase Access for U.S. Businesses? The Answer is in the Details! October 4th, 2015, marked a new era of “potentially” improved trade for U.S. Businesses with members of the Trans-Pacific Partnership (TPP). The TPP is a trade agreement among 12 countries on the Pacific Rim. Member countries include: USA, Australia, Brunei Darussalam, Canada, Chile, Japan, Malaysia, Mexico, New Zealand, Peru, Singapore and Vietnam. The TPP agreement proposes to promote economic growth; support the creation and retention of jobs; enhance innovation, productivity and competitiveness; raise living standards; reduce poverty in member countries; and promote transparency, good governance, and enhanced labor and environmental protections. Eliminate or reduce tariffs and non-tariff barriers among member countries, on industrial goods, agricultural goods, textiles and apparel. This could create an avenue for U.S. businesses to sell more ‘Made in America’ goods and services, around the world. In addition, the TPP provides for a transitional safeguard mechanism, protecting members if imports increase as a result of the tariff cuts. Implement Technical Barriers to Trade (TBT) rules. These rules create a framework for developing technical regulations, standards and conformity assessment procedures, while preserving TPP members’ ability to fulfill legitimate objectives. Furthermore, the TPP aims to improve transparency in customs procedures and ensure integrity in customs administration, providing predictability as businesses navigate various custom procedures between member nations. This will provide some ease and boost to U.S. Businesses in exporting products through standardize streamline custom procedures, which can sometimes be an impediment to exports. Establish rules for requiring non-discriminatory investment policies and protections that assure basic rule of law protections, creating an atmosphere for increased Foreign Direct Investments. The TPP provides that members’ markets will be fully open to foreign investors except where members have taken a non-conforming measure in one of two country-specific sectors and annexes: (1) current measures on which a member accepts an obligation not to make its measures more restrictive in the future and to bind any future liberalization, and (2) measures and policies on which a member retains full discretion in the future. Ease of entry for business persons between member countries. The TPP encourages members to ensure application fees for setting up businesses are reasonable, application materials are readily available and approvals have a quick turnaround for undertaking operations in the member countries. Adopt and implement national competition laws that proscribe anticompetitive business conduct by establishing or maintaining authorities responsible for the enforcement of these laws. Furthermore, the TPP aims to make it easier for businesses to search, register and protect IP rights in new markets in a timely and efficient manner. The content of the TPP agreement has not yet been released by the government, but the U.S. Trade Representative has released a summary of its 30 chapter. Each member country would have to follow its own domestic procedures for ratification of the trade agreement, including the U.S. where the TPP agreement has to be passed by the Congress. Stay tuned for a detailed analysis, once the content of the TPP agreement is made available.